Find up to the minute news on what’s happening for Scotland’s care leavers. Our Spring conference, held in March 2019 focused on home, connection and felt security. Addressing these key concepts within the context of rights and wellbeing, we explored what this means for care experienced young people and for Scotland's corporate parents as they support their care experienced young people in their journey to adulthood and interdependence. You can view the keynote presentations on the Conference page. The Scottish Government has published a summary of responses to their consultation on the Continuing Care (Scotland) Amendment Order 2019 made under the Children and Young People (Scotland) Act 2014. There was universal agreement from the 4 individual and 22 organisations who responded that extending the upper age limit of eligibility to twenty-one is the expected and welcomed course of action. CELCIS has published a research study which examines independent supported accommodation commissioned by local authorities in Scotland. The study involved visits to four independent providers that provide supported accommodation for ‘homeless young people’ in Scotland. In reality these services are providing ‘move on’ accommodation for care leavers between the ages of 16 and 18. All the services reported that young people were generally arriving too young to easily manage the responsibilities of adult life, and it is generally the most vulnerable/unsettled young people who move into this type of accommodation. What I found was a ‘mixed bag’ of strengths and challenges, and for me it’s difficult to draw common conclusions. The Scottish Care Leavers Covenant Alliance, in association with CELCIS has published a Good Practice Note for local authorities who are implementing the recent legislative change which determines that all young care leavers across Scotland are exempt from paying council tax. The practice note is in response to feedback from a wide range of stakeholders, gathered at a recent roundtable workshop, where they discussed the effective and consistent implementation of the Council Tax (Discounts) (Scotland) Amendment Regulations 2018 (SSI, 2018 No.39) (the Regulations) in their role as Corporate Parents. The Practice note outlines key considerations and a range of measures for local authorities to take in implementing the regulations, now established in law. This practice note is drawn from the discussions and outlines key considerations and a range of measures for local authorities to take as Corporate Parents to ensure consistent and effective implementation of the regulations, now established in law. South Lanarkshire Council has become the latest local authority to show its commitment to Scotland’s care leavers, by signing up to, and endorsing the Scottish Care Leavers Covenant. Conference-goers packed into council HQ as speakers discussed What Matters to Me at the Corporate Parenting Conference. Councillor Maureen Chalmers, Deputy Leader of the council, and Service Manager Liz Lafferty took time out to sign up and demonstrate the council’s support to work for real change in the lives of young people with care exerience. "The Council Tax exemption is a positive step to begin to address the issue of care leaver poverty and financial hardship, and the assumption of entitlement supports and informs this. However it is only a one of a range of inter-connected steps that need to be taken. WE know from other positive policy intentions that implementation can be inconsistent and today's event is designed to address some of the blocks and enablers." We had a series of brief presentations from Jenny Kane (Falkirk) Chris Wright (Dundee City) Peter Finn (Glasgow) and Jean Cullen (North Ayrshire) who described how implementation was being approached in their respective local area, identifying the positive measures taken to ensure consistent implementation for all eligible young people, and highlighting some of the ongoing challenges, for example re identification and notification issues and the thorny issue of outstanding arrears. Charlotte Armitage described the really positive impact this exemption had on her as a care experienced young person, lifting a financial burden that most other young people wouldn’t have to face at their age as they would have financial support from the family home. Charlottes insightful and passionate contribution highlighted that whilst the council tax exemption was very positive initiative, we need to look at the wider context of why care experienced young people were put into this situation in the first place at such a young age. The plan is to develop a Good Practice Note and circulate throughout the sector to further support and ensure consistent implementation across all 32 local authorities. In this response we highlight our belief that the current situation is not acceptable for care experienced young people. Accruing ‘convictions’ in childhood for behaviour that may be rooted in trauma, can have a life-long impact and it is essential to avoid inappropriate and disproportionate adult responses. The psychological and emotional impact of the disclosure process can serve to have a re-traumatising and stigmatising effect. This can act as a barrier to care experienced people applying for work in the first place and impede their ability to ‘move on’. The University of Strathclyde has won an award for its innovative programme which supports young people with experience of care to progress through higher education, from pre-application to graduation and beyond. Strathclyde Cares was presented its Guardian University Award on Tuesday (24 April) this week under the 'Retention, support and student outcomes' category. The Awards, which are in their sixth year, recognise the universities that inspire students and transform communities. On 25 April 2018, the Scottish Care Leavers Covenant, CELCIS and CYCJ brought together over 80 delegates from the youth justice and looked after children workforce to discuss and debate the important issues surrounding the disclosure of childhood criminal records. Speakers from Disclosure Scotland, Who Cares? Scotland, Scottish Children’s Reporter Administration, Clan Childlaw, and the University of Strathclyde provided an overview of the current system of disclosure, highlighted areas of challenge, and explored the potential options for systems change. Presentations and voice recordings from this event and a write up will be available on our website soon. At the event, Scottish Government launched a consultation on proposals to review the disclosure regime, including the Protecting Vulnerable Groups (PVG) scheme. As Scotland’s first dedicated care leaver employer, Nevis Group is the most recent organisation to sign up to the Covenant. "We are delighted and proud to sign the Scottish Care Leavers Covenant. As an organisation that focuses on the employment of care leavers, helping them to break down the barriers that may hold them back in employment and life as well as challenging the negative perceptions of care leavers in the labour market, it was a ‘why wouldn’t you’ moment for us. "Nevis Group is Scotland’s first dedicated employer of care leavers, offering a real job for a real living wage with no strings attached. Through our CareTrade brand we also offer training and support to help care leavers become professionals with care experience rather than professional care leavers." Nevis Group will be opeining the Nevis Coffee & Bistro in Glasgow City Centre later this year. Pictured: Council Leader Jim Logue and Councillor Willie Goldie sign the Covenant with Kenny McGhee from the Care Leavers Alliance. North Lanarkshire Council is the latest organisation to sign up to the Scottish Care Leavers Covenant. Health, housing, education, employment and young persons’ rights are key areas the council will consider along with its partners, to deliver practical assistance for young care leavers. “Care leavers often struggle on the journey out of care and into independence, as for many there is little support or practical guidance. As a result, the challenges are often too great and they can continue to experience problems that lead to far poorer outcomes than their peers. “Often care leavers find it challenging to make the transition into adulthood with little support in securing employment, maintaining tenancies, accessing health services and finding training or further education opportunities. Assumption of entitlement – care leavers are entitled to services, support and opportunities, up to their 26th birthday. Staying put and continuing care - care leavers are actively encouraged, enabled and empowered to benefit from ‘Staying Put’ arrangements, remaining in positive care settings until they are ready to move on. Relationships - demonstrate that priority is given to relationship-based practice, based on understanding, empathy, respect, and ‘stickability’. “We are delighted North Lanarkshire Council have joined the growing number of Scottish local authorities in making this commitment to their care leavers. “The Covenant urges all corporate parents to be the very best they can be to ensure that their care leavers benefit from the highest levels of care and support into adulthood." “Being a corporate parent is the most important job that any individual or organisation can have. The Scottish Care Leaver’s Covenant is a vital contribution to ensuring that services work for young people with care experience. I hope that more organisations sign up not just in name but in action too. South Ayrshire Council has just signed up to the Covenant. They're keen that everyone in South Ayrshire has the opportunities to achieve their ambitions regardless of background. The Council is looking to provide the best care possible and is following the guidance set out in the covenant to ensure young people don’t become disadvantaged as a result of their care experience. “We are already committed to ensuring all young people have the best possible start in life and signing the Scottish Care Leavers Covenant cements our position." Bruce Adamson, Children and Young People's Commissioner for Scotland gave a keynote speech at the recent and first ever Scottish Care Leavers Covenant Conference in Glasgow. He spoke passionately about his commitment to the rights of care leavers, and the need to get the great policies and actions of the Covenant into practice. We need to do this together. Bruce's starting point is always happiness, love and understanding. Delegates took part in a variety of workshops, showcasing co-production at it's best. The photograph shows some of our Alliance Group members with the keynote speakers. A full conference report will be available soon. The Scottish Government has announced the law is to change to exempt all young care leavers from paying council tax. The Scottish Care Leavers Covenant Alliance group, with partners, has been campaigning for this change in legislation in recent months. Many local authorities have endorsed the Covenant, and it is supported by individual MSPs from all the main parties. "The announcement by First Minister, Nicola Sturgeon, presents a fundamental change to law in making young care leavers exempt from paying council tax. "Care leavers are particularly vulnerable when it comes to the financial demands of independent living. The impact of poverty on care leavers is well documented. One of our main concerns is how council tax debt can escalate quickly, increasing the pressure on care leavers. "This is a huge step in reducing the financial burden on young care leavers in Scotland. "The Scottish Care Leavers Covenant supports the principle that corporate parents will assume all care leavers are entitled to services, support and opportunities, up to their 26th birthday. "This change in law is a fantastic example of corporate parenting in action." North Ayrshire Council wants to be the first local authority in Scotland to exempt care experienced young people from Council Tax. Scottish Councils do not have the power to introduce Council Tax exemptions however the Council is calling on the Scottish Government to give them delegated powers. To allow them to do so the Scottish Government would have to amend the Local Government Finance Act 1992 or implement new Council Tax exemption regulations. “One of the most important roles Councillors hold is as a corporate parent to our young people in care. “This is a group of young people with talent, skills and ambitions just like their peers. However, we know the many challenges they face in being able to fulfil their potential. It is therefore our task to provide the right mix of support and opportunities to allow young people in care to achieve their life goals. “Here in North Ayrshire we have taken steps to put care experienced young people at the heart of what we do but we can go further. There are significant financial pressures on young people leaving care including Council Tax and one way we could help financially would be to exempt them from that. The two year pilot, delivered in partnership with Almond Housing Association, will place vulnerable young care leavers into permanent housing, rather than temporary accommodation. This will be the first time the Housing First model is used with a focus on young people in the UK. There are currently nine projects in England and one in Scotland which support adults of all ages. This approach differs from traditional routes to permanent housing, as young people do not pass through stages of temporary accommodation before being placed in their own home. Councillor George Smith of Shetland Islands Council, has signed the Scottish Care Leavers’ Covenant, pledging to support young people after they leave care. Signing the Covenant affirms Shetland's commitment to improving the lives of young people as they transition into adulthood. Shetland Islands Council recently agreed to form a Corporate Parenting Board, that will oversee the implementation of the Corporate Parenting Strategy, in line with requirements of the legislation under the Children and Young People (Scotland) Act 2014. The continuing care legislation set out in the Children and Young People (Scotland) Acts supports providing continuing care for young people over the age of 16 and under 26 years. This has caused some confusion around registration requirements for workers and services, as continuing care for young people beyond the age of 16 may mean for some residential childcare services are caring for young adults as well as children and young people. Scottish Social Services Council (SSSC) and the Care Inspectorate have announced that there will be no changes to registration requirements. Questions about how staff and services should be registered with the SSSC and the Care Inspectorate have been raised, but care homes and school care accomodation will continue to be registered with the Care Inspectorate as residential childcare services. If you work in these settings, you will continue to be registered on the parts of the SSSC Register for child care and residential school care, meaning no changes are needed to your registration. The Scottish Care Leavers Covenant was launched in October 2015, to help change the lives of care leavers. It supports Scotland’s corporate parents, carers, practitioners, managers and decision makers to fulfil their duties. Almost 500 organisations and individuals have endorsed the Covenant so far and it’s being used by corporate parents, at both strategic and operational level, to remove barriers, change culture and improve core practice. We’re bringing together leaders and practitioners to chart progress, share learning and identify challenges and opportunities. Professor Stein has many years experience in training, dissemination and consultancy work with local authorities and voluntary organisations to improve their services for vulnerable teenagers. He has substantial experience of directing, supervising and carrying out research and evaluation, pioneering research on care leavers over 30 years in the UK and internationally. He is currently a joint co-ordinator of the Transitions from Care to Adulthood International Research group (INTRAC) representing 17 countries and worked with SOS Children¹s Villages in pioneering research on leaving care in post-communist societies. Professor Stein was involved in the preparation of Guidance for Leaving Care legislation in the UK for: the Children Act 1989; the Children (Leaving Care) Act 2000, and; the current Children Act guidance and Regulations (Vol 3: planning transitions for care leavers). He was also consulted by the DFE on Keep on Caring, supporting young people from Care to Independence (2016); and by Sir Martin Narey on Residential Care in England (2016) and is currently a member of UNICEF¹s Children¹s Rights Partners Advisory Group and Social Finance steering committee, Leaving Care Analytics Hub. "The National Leaving Care Benchmarking Forum is delighted to announce their endorsement and whole hearted support to the Scottish Care Leavers Covenant. The 88 English local authority members voted overwhelmingly to support the Covenant at their managers peer support conference in July 2017. We look forward to working together to continue to promote best practice and improve outcomes for care leavers both north and south of the border. Scotland and England's care leavers should indeed expect nothing less from their corporate parents and indeed wider society." "I am delighted to sign up to the Scottish Care Leavers Covenant and endorse the guiding principles contained within it. My own legislation extends my mandate to promote and safeguard the rights of young people up to age of 21 if they are care experienced and from the earliest days of the office, the rights of those leaving care has been a priority. Many of the serious concerns identified in Sweet 16? The Age of Leaving Care in Scotland, the report that my office laid before the Scottish Parliament in 2008, unfortunately still exist today. "We know that young people leaving care often struggle in their transition to adulthood and that this can result in much poorer outcomes for them than their peers. Alongside the special protection and assistance guaranteed in Article 20 of the UN Convention on the Rights of the Child (UNCRC) to children in care, care leavers must be supported to enjoy all their human rights throughout adulthood. In 2005, the UN Committee on the Rights of the Child issued recommendations that States Parties and other stakeholders facilitate and enhance the child’s transition to independent living. The Scottish Care Leavers Covenant brings this commitment to life. "The Covenant challenges current thinking and practice. It provides clear actions for change across the broad range of civil, cultural, economic, political and social rights. It aims to reduce health inequalities, social exclusion and isolation, and to improve access to suitable housing as well as addressing homelessness. It prioritises the full and meaningful implementation of Staying Put to ensure that the right to remain in positive care settings until care leavers are ready to move on. It requires actions relating to youth justice, as well as addressing important ongoing issues such as access to training, education and the employment market. Importantly, the Covenant also calls on corporate parents to take a rights-based approach to support and services for care leavers is adopted which puts their empowerment and participation at the heart of decision-making. We were delighted to join Rachel Farrier of Street Legal as she formally signed up to help Scotland's care leavers by endorsing the Covenant. Street Legal is a new partnership project between Clan Childlaw and Streetwork and provides free legal advice and help to young people (up to the age of 26) who are, or at risk of homelessness in Edinburgh. We're delighted to have you on board! MCR Pathways became the latest organisation to sign up to the Scottish Care Leavers Covenant recently, committing to work towards real change in the lives of care leavers. MCR provides school-based mentoring support for care experienced young people. To help them reach their full potential. The Covenant outlines the partnership approach that’s needed to make real and sustained changeand offers clear guidance on how to meet the needs of young people who are often face additional disadvantage. "MCR Pathways is absolutely delighted to support the Scottish Care Leavers Covenant in their mission to encourage more corporate parents to actively provide advice, support, a helping hand and tangible opportunities for our young people. Providing schools-based mentoring and talent development, we see the challenges our care experienced young people face every day. Our programme, and Glasgow's volunteer mentors, are making a life-changing difference. Through providing our young people with a listening, encouraging ear and sparking aspirations, we're having a massive impact on staying on rates, attainment, and positive post-school destinations. The work that the Scottish Care Leavers Covenant does is fantastic. We're extremely proud to share their values - to ensure every single young person in Scotland gets the same educational outcomes and life chances as their peers. Regardless of their background or circumstances. Read about the impact of the council tax on care leavers and the financial hardship they face. Edinburgh Napier University sign up and go public! Professor Andrea Nolan, Pincipal at Edinburgh Napier University announced that they'd signed up to the Covenant in a really public way. 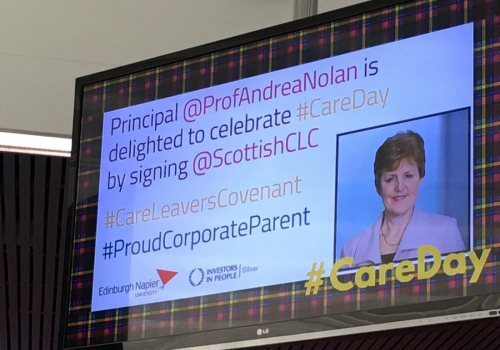 They chose Care Day on 17 February to sign up and make it public by beaming it across the university on their IT screens. North Ayrshire Community Planning Partnership pledged its support for the Scottish Care Leavers Covenant when Joe Cullinane, Chair of the CPP (and Leader of North Ayrshire Council) signed up to the Covenant. At their December meeting, the Board heard a presentation on Corporate Parenting that spoke about the importance of work opportunities for young people to help progress towards a positive destination. They agreed to make a social impact pledge on increased support for care leavers including employment opportunities, work experience, and Modern Apprenticeships or mentoring. So far, Elma Murray, CEO of North Ayrshire Council, and Brian Shaw, Chief Inspector, Police Scotland and CPP Board member, have agreed to mentor a young person in a Modern Apprenticeship role. Scottish Fire and Rescue Service are currently discussing work experience programmes that they can provide. The Care Inspectorate has become the latest organisation to show it's support to Scottish care leavers by signing up to endorse the Covenant. "I welcome the opportunity to support and endorse the Scottish Care Leavers Covenant and Agenda for Change, and its principles and actions. “Improving outcomes for looked after young people and care leavers is a collective responsibility and the Care Inspectorate is committed to working in partnership to support Scotland’s corporate parents to ensure that our looked after children, young people and care leavers benefit from the highest quality of care. “We are committed to supporting the consistent implementation of good practice, working alongside providers and practitioners to drive continued improvement of care, to raise standards and expectations and to make Scotland the best place for children to thrive and grow up. The Scottish Care Leavers Covenant offers a clear and engaging framework to bring consistent to practice for young people transitioning from care and for their continued support into adulthood." Joyce White CEO and elected members from West Dunbartonshire Council signed the Covenant at a recent corporate parenting event. Dr Brodie Paterson signs the Scottish Care Leavers Covenant on behalf of Calm Training. Pictured here at the Scottish Learning Festival with Lizzie Morton of CELCIS. Karolina Kozlowicz, Programme Officer at Child Rights Partners, Unicef UK took time out of her busy schedule to show her commitment to Scottish care leavers. She visited the CELCIS office to sign the Covenant and endorse its Agenda for Change. "We welcome the Scottish Care Leavers Covenant and its explicit recognition of the need for more robust support for care leavers. As an organisation focused on promoting and advancing the rights of children and young people, including the most vulnerable, we share the concern expressed by the drafters of the Covenant that there is an urgent need for policy commitments to be translated into practice through coordinated, effective implementation. We endorse the focus within the Covenant on the young person and their outcomes and commend the call for a child rights approach to frame all services for care leavers. A child rights approach empowers and brings professionals and young people together, creating a space for dialogue and for young people to influence and shape the services that are there for them. As stated in the Covenant, in order to secure a transformational change in outcomes for care leavers, a shift in both culture and practice is needed. We believe a child rights approach provides a framework that can facilitate such a shift." Chief Executive Anna Fowlie signs the Scottish Care Leavers Covenant on behalf of the SSSC. See the full story on their website. Kenny McGhee of CELCIS blogs on the Covenant, six months on. Read the blog on the CELCIS website. Read the story in The Extra. What's happened in the last six months? Read Kenny McGhee's blog on the first six months of the Covenant. Hear about the blood sweat (and tears) that went into producing the Covenant, and the plans as we move forward. Read Kenny's blog on the CELCIS website. Each young person is allocated a dedicated mentor who will become their advocate, adviser and provide one-to-one support to help with a successful transition from their Schools Academy course into a full-time or work-based course at Borders College. Principal Professor Sir Jim McDonald signed the Covenant on behalf of the University of Strathclyde, helped by Laura Burton, a first year Social Work student and Kimberley Calderhead, a Modern Apprentice with CELCIS, the Centre for Excellence for Looked After Children. An accessible resource for corporate parents and other organisations providing support services to care leavers. It supports the preparation of corporate parenting plans and service delivery plans. The framework can be incorporated and integrated fully into local plans, or can be adapted to meet local circumstances and specific outcomes. Recent care leaver Connor Chalmers one of the young people who helped guide the work behind the Covenant, appeared in the December issue of Children in Scotland magazine.